As promised earlier in the week, I got Ryan Smith, the Gameological critic handling Destiny, on the horn to answer reader questions about the game ahead of his full review. We touched on a lot of subjects, and I think, in the end, covered most of the questions that came up. Of course, you don’t need to just chat about Destiny here. This is still What Are You Playing This Weekend?, and we want to hear about your gaming plans in the comments. Matt Gerardi: So Ryan, we don’t need to ask what you’re playing this weekend. We already told everyone. You’re reviewing Destiny, which is this big giant game from the creators of Halo that cost hundreds of millions of dollars and has been hyped to high heaven. How’s it been treating you so far? Ryan Smith: It was rough going at first. I had issues with installing a patch and connecting to the server, and it took me over an hour and a half to actually start playing the game after putting the disc in my Xbox One. That’s standard, I suppose, for a lot of massively multiplayer games but not for shooters with “single-player” components. But it’s been pretty smooth since then. I’ve put in about 12 hours so far—probably eight in the single-player story and cooperative missions and about four in the “Crucible” which is the player-vs-player multiplayer. I’ve been mostly earthbound so far, but I landed on the moon last night, which was quite a sight to behold. RS: I’d say the Earth, where you spend much of your first several hours of Destiny, looks much like a typical post-apocalyptic wasteland in games—lots of brownish-hued environments and said down-on-their-luck warehouses. But the moon is actually a striking place. It’s cold and remote, yes, but it does actually feel a bit like you’re on the surface of our moon. You’re like a badass John Glenn or something. I still haven’t been to Venus, and only played a multiplayer map of Mars, so the jury is still out on those planets. The Tower, which is sort of your social hub city, is sort of a dumbed-down Citadel from Mass Effect. One thing that bothers me, though, is that even though you have these floaty double jumps, the gravity works exactly the same on Earth as it does on the moon. So, yes, functionally, Earth and the moon play the same. MG: That’s pretty lame. Playing with the gravity sounds like it would have been fun. RS: Yeah, it’s something that the upcoming Borderlands game, The Pre-Sequel, does pretty well. It makes you relearn movement in a low-gravity environment. RS: There is definitely not an ounce of humor in Destiny. Once in a while, your floaty little robot companion voiced by Peter Dinklage makes a wry quip, but they all fall super-flat. Funny is not Bungie’s strong suit. But if we’re going to play the influence game, I’d say Destiny is a mixture of Borderlands without the humor, Diablo without the Satanic lore, World Of Warcraft without the stupid pandas, and Halo with a million different Master Chiefs. The game didn’t make a large impact, but there are actually a lot of similarities to Defiance too. RS: I mean, the short answer is that it’s both a shooter and an MMO, and it’s a sort of uneasy fit sometimes. For example, the Tower is weirdly designed, so you have to do a ton of unnecessary walking to different vendors and class trainers that are dotted around the place. Why did Bungie streamline some MMO trappings but not others? I think for players of shooters, one of the most jarring things will be the repetition and grinding. MMOs are built on repetition, but to play the same levels and missions over for better loot in a first-person shooter is a different beast. But there are elements of the MMO portion which actually enhance the experience. There’s more randomness that can happen because there are real people interacting in the same spaces as you, and sometimes things go off-script in ways you don’t expect. So it’s not the worst of both worlds, but it’s a jumbled, odd beast of a game that takes time to find a rhythm in. Maybe you could call it an MMOARPGFPS? You know, just to clarify things. RS: If by “actual,” they mean “good,” well, no. But there is some skeleton of a story—told to you in the most boring fashion possible by your floating robot companion. You do meet some authority figure in the Tower and talk to him once in a while about something important. I’ve forgotten his name and title already. But when you’re not shooting, most interactions with characters are transactional. And that’s disappointing because they’re wasting some talent there. For example, the actor who plays Lt. Daniels in The Wire [Lance Reddick] has a tiny role as a class trainer for the Titan class, which means two-thirds of players have no reason to ever talk to him! I guess to the game’s credit, the story doesn’t really get in the way. It’s just there as a table-setter. But overall, it feels like a half-baked version of the Halo lore. Talk of “Guardians” and “Darkness” and sci-fi nonsense. Also, your character speaks only like one sentence every couple of hours. I’d prefer either less or more. RS: Oh, it’s definitely trying to be addictive, no question about it. The kind of addiction is, again, somewhere between Borderlands and Call Of Duty multiplayer. There’s the Pavlovian kind of addiction where shooting things in the face is like pulling the lever of a slot machine to hit the jackpot and get cool loot. 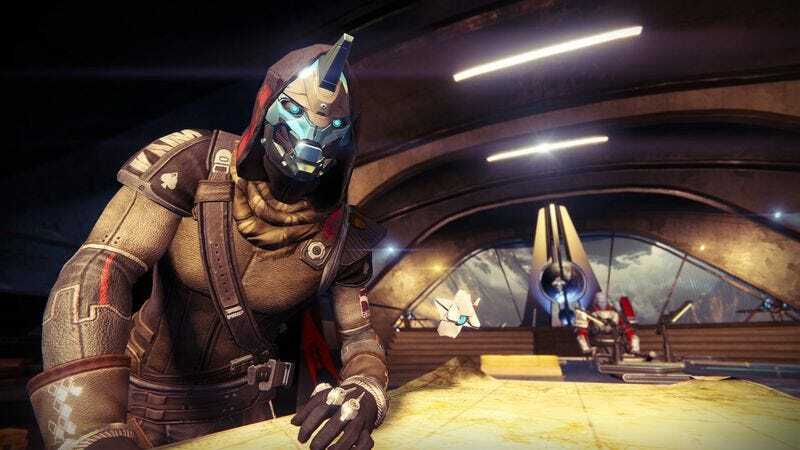 Then there’s the advancement aspect—ranking up your character and maxing them out in order to have a slight edge in competitive multiplayer or in Destiny’s version of dungeon raids for high-level players. Then, I suppose, there’s just the social pressure quality to it. If you join a clan and play with friends, you’re more likely to keep playing with those same people because it’s a social activity. If you’re a solo, non-social player, it will be easy to quit Destiny cold turkey. MG: Yeah, that’s the impression I’ve gotten from it: a lot of meaningless busy work that’s not very compelling on your own but seems like it would be fun if you’re just hanging with some buddies. RS: Yep. There should be a warning on the box saying that online friends should be required to play, along with an Internet connection. It wouldn’t be great for sales, though. There’s also something about the sparse, empty environments which makes the game feel all the more lonely by yourself. MG: That’s not inherently a bad thing. Do you think it is in this case? RS: It works well in a shooter like Metro 2033, where they’re creating an atmosphere of tension and dread. Here it just mostly feels boring. RS: There are genuine and spontaneous moments that can come because of the way the world is populated with other players. For instance, I was on my way to a quest on Earth and was prepared to do battle with a large group of enemies, but a random team of other players hit them first, and the baddies didn’t see me approach from the flank. So I had time to sneak up further and hit them with a surprise attack in a way that wasn’t scripted. Then, I ended up teaming with the group for a few more encounters. I also like that you encounter other players in the world, but unless you’re online friends, you can’t actually speak to them except through a few emotes. It limits the bad encounters you can have with strangers in a shooter. It’s rare in an online shooter where you actually can get affinity for a random player, but last night my friend and I grew fond of someone named Kyndred playing with us, just because he kept dying over and over, yet kept trying. He felt like our Destiny puppy dog. That said, it’s unlikely you’re going to have any interaction with 95 percent of other players. But the moments that you do connect can feel unique. MG: That does sound pretty nice. I’d guess we’re going to hear some more about those moments in your full review. RS: Yeah, I’ve probably tipped my hand a little too much in this discussion, but I’ve got more playing to do, so it’s possible my opinions will evolve. MG: There’s nothing wrong with a little appetizer. Thanks for the chat, Ryan. I’m looking forward to hearing more about it.